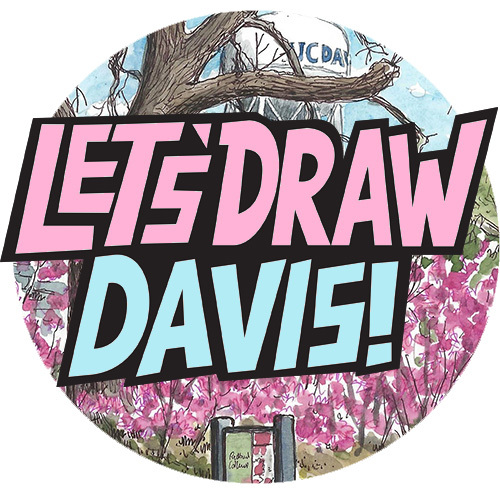 And finally, here are the sketches from last month’s “Let’s Draw Davis!” sketchcrawl, the centenary tour of old Davis. 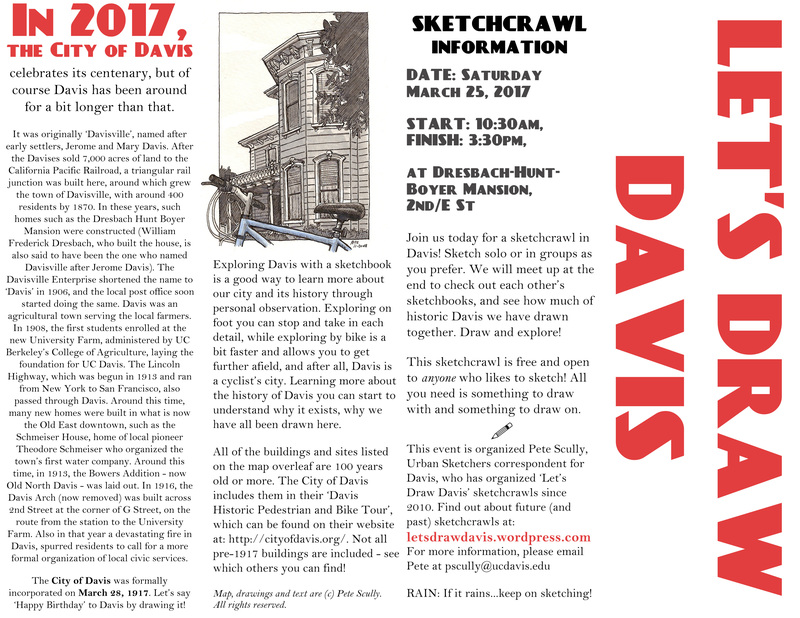 A group of us met up on a Saturday morning outside the Dresbach-Hunt-Boyer Mansion at the corner of E and 2nd Streets, and set off exploring and sketching the bits of Davis that were a hundred years old or more. Because Davis, you see, celebrated 100 years of being The City of Davis in that very week – but it’s been around a lot longer than that. In fact I might have called this sketchcrawl “Let’s Draw Davisville!” because that was the name of the place up until around 1907 or so. Davisville was named after Jerome C. Davis and his wife Mary, who owned a lot of the land which eventually became the city, and the man who coined that name was the early postmaster Mr. Dresbach, and this was his house. I gave everyone a special map that I created, which you can see below. On the reverse side it includes a little bit of local history, but on the map side are listed most (but maybe not all?) of the buildings and spots that are 100 years old or more. I have drawn many of them already (see the pictures around the edge) but this was a nice way to start checking off those extra-centurions from my to-draw list. By the way, I think “F” may be in the wrong place, I couldn’t find it and it’s not signposted. There are also a couple of places at least outside this map which may be a bit older, but if I start going beyond the realms of cartography, well, where does that leave us. Hey if you live in Davis and want to try sketching them all, download the pdf map and let me know how you go! 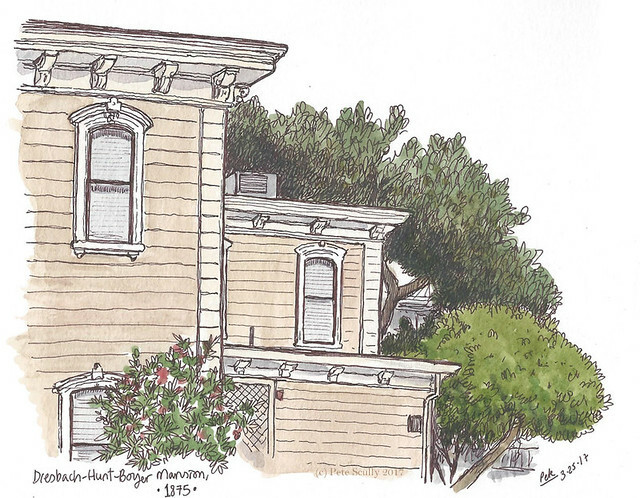 So, after I sketched the Dresbach Hunt Boyer Mansion I went over to G Street, and sketched the Masonic Lodge. Yeah, you didn’t notice that either huh! I never knew this building was a century-old Masonic Lodge, only paying attention to the ground floor shop level. Trees usually block it, but you can see the masonic symbol up there if you look closely. I sketched this from outside the G Street Wunderbar. Those odd shapes in the front are cars, or the ghosts of cars maybe; I decided I couldn’t be bothered doing any details on them. You have to imagine 1917 vehicles. 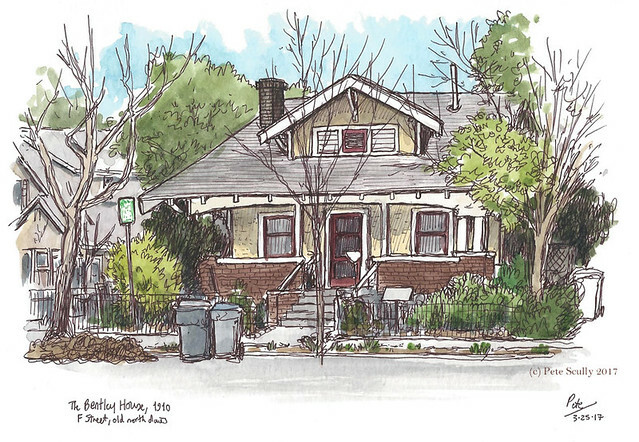 This building, which is across the 5th Street border in Old North Davis (the Bowers Addition, which is over a century old; I will write an Old North-centric post soon…), is called the Bentley House. In fact I did not know about it until a few days before, while still putting the map together. Iw as coming baxck from downtown and passed by it, and they actually ahve a big informative plaque outside with its history on it. It celebrated a centenary in 2010, so by that I deduce (my dear Watson) that it must date back to 1910. It’s pretty, in a pretty neighbourhood. Below the sketch is a photo of the plaque, with a century of history. My final sketch of the day is another structure from 1917, not a house, but a tunnel. 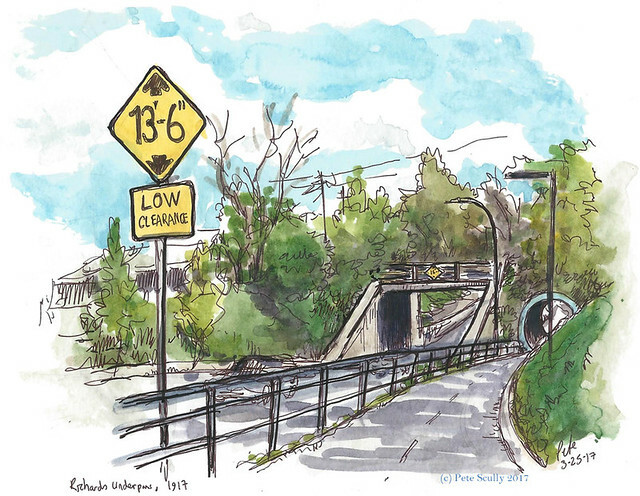 The Richards Underpass (or rather, the Davis Subway as it is properly know) links downtown to the other side of the railroad tracks, toward south Davis, and the I-80 freeway. It was part of the old Lincoln Highway, that connected San Francisco with New York. Yeah, that New York. This tunnel leads to the whole world, baby. Well, it is actually on the National Register of Historic Places. She doesn’t look like much but she got it where it counts. It’s a popular place to sit bottlenecked in traffic too, coming into Davis off of the freeway, and I like to imagine Dr Doom sitting in a metallic grey and green car fuming away beneath his metal mask at “that FOOL Richards” and how “I, Victor Von Doom, would have created a far superior underpass!” Oh you’ve gotta love Dr. Doom. And then we met up, those that remained, and looked at each other’s sketches. 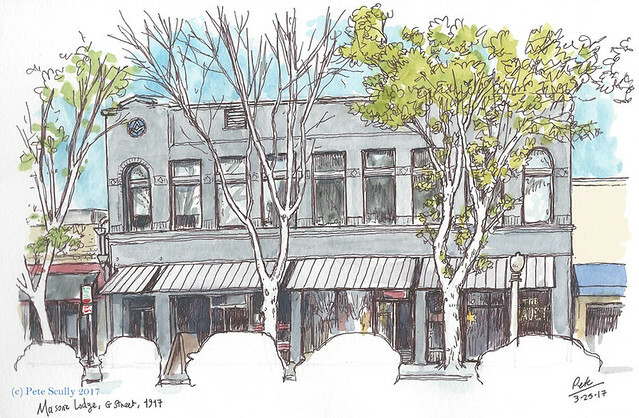 I have yet to find time to set the next sketchcrawl here in Davis, but I am working on it. This one was fun, but you know, you can sketch old Davis in your own time, just grab that map, grab a pen or pencil, and get sketching! Well done the Davis sketchers! Oh and Happy Birthday City of Davis! Great event. Mmmm I might have to steal the idea of ghost cars – mine always fail to look convincing.